I remember being nervous in high school as I waited to be asked to the Valentine's day "sweetheart" dance. Not being asked was my girlfriends subtle way of setting me free. I spent the evening with a friend driving to Darwin, Minnesota to see the biggest ball of twine in the world. I've perhaps been skeptical of dances ever since. Now, later in life and as a professional naturalist, I think about one dance in particular as I prematurely take off layers of wool and don shorts on fifty degree days. The signs of spring tell me it is time for the Timberdoodle Twirl. The Twirl, a.k.a. the Sky Dance, is a secretive event that only occurs in the spring. Naturalists have attended the twirl for centuries and yet it remains a little known event to most outsiders. You will not be invited to the Twirl. There are no invitations and no awkward propositions. You don't need to trek to the giant twine ball when you're not invited to the dance. If you want to attend the Timberdoodle Twirl you need to first figure out where it is held. If you are lucky enough to know someone who has been to one in the past then you have an easy in. The only other option is to hunt down the location on your own. Although locations do change, the Twirl often takes place in the same spot for generations. Timberdoodle Twirls are usually situated on the edge of meadows. There must be enough room to twirl. There must also be a woods nearby with young trees such as aspen and alders. A stand of sumac may work in a pinch. It all depends how picky the dancers are. The Timberdoodle Twirl is an elaborate dance that can only be performed by the highly experienced and rules dictate that it can only be performed in the dying rays of twilight. A full moon rising in the east makes it all the better. Dim lighting sets the mood. The Twirl is about one thing; bonding with hopes of mating. If you think you're up to participation in the Twirl keep in mind that none of the naturalists are. There are two requirements. To perform in the Timberdoodle Twirl you must first off be a male. This precludes half the population but you must also be able to flap your arms hard enough to fly. This tends to rule out the rest of us. To actually take part in the Timberdoodle Twirl, you must be a timberdoodle. The males of this strange slightly spherical species perform an elaborate mating dance we naturalists call the Timberdoodle Twirl or the Sky Dance. The timberdoodle, also known as the American woodcock, is a secretive bird that spends most of its time in the woods probing the ground with a ridiculously long beak. Technically, the woodcock is a shorebird but with the beaches being such historically crowded places who can blame it for preferring the solitude of the woods? 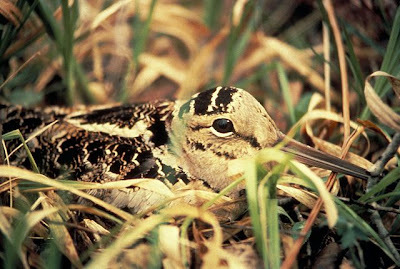 In the woods, the sensitive beak searches the earth for worms and insects. With eyes on the sides of its head it can see both in front of and behind itself at the same time. It can also see above itself, which is useful for keeping an eye on both predators and dancers. Any evening, April through May, you may have luck discovering the secret dance of the timberdoodle. As the sun sets, listen for the buzzy "peent" call of the male bird. It shouts to the females, "Look at me, I am about to dance." This is personally a declaration I have never shouted on a dance floor so I admire the bird's self esteem. After a few minutes of peenting, the male soars two hundred feet or more into the sky. The spiraling skyward travel is accompanied by a twittering sound produced not from the throat of the bird but by air rushing over the wings. If you approach from the east you can see the bird silhouetted against the dying rays of the day. The bird then sings a dreamlike courtship song in a liquidly warble while beginning a leaf-like fluttering descent to the earth. It goes silent a few feet from the ground and alights gently on the dance floor. Upon landing, he immediately starts up with the peents again, trying to call in a female to watch his elaborate dance. The springtime ritual of the Timberdoodle Twirl probably occurs near your home. Visitors to Lake Elmo park have seen it and Warner Nature Center offers a guided Timberdoodle Twirl program each spring. When you discover the secret location of the Timberdoodle Twirl, hold that information dear. You are witness to a marvel seen by few. Remember though, unless you can fly, you'll be asked to sit this dance out.